With the purpose of increasing the operation reliability and optimization of transformer maintenance procedures, Eletronorte looks for implementing on-line monitoring systems for its substation assets. To do that, it is necessary to install reliable sensors at field, integrated to a communication network in order to transmit in a remote way the variables measured on-line. This article presents how the local environmental conditions of installation, available infrastructures and needs of the operation and maintenance teams at field, among others, determine the technical criteria and requirements to be demanded from the communication networks and smart sensors used in the composition of substation asset management systems. 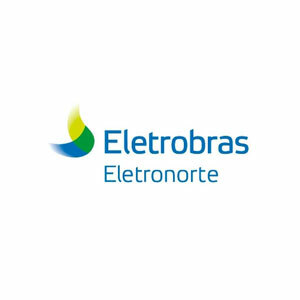 Eletrobrás Eletronorte makes power generation and transmission to the nine states of legal Amazon region – Acre, Amapá, Amazonas, Maranhão, Mato Grosso, Pará, Rondônia, Roraima and Tocantins, by servicing a population over 15 million people. To do that, it has installed power of near 9,300MW and almost 10,000 kilometers of transmission lines. The wide geographical area where the Eletronorte substations are distributed, combined with the great importance of power transformers for continuity and reliability of power supply in the north region of the country, makes the increase of the operation reliability and optimization of the maintenance procedures of transformers imperative for the company success. To reach those goals while providing conditions for low-cost energy rates, Eletronorte is carrying out the smart sensing process for transformers and reactors, with the aim of enabling the early detection of defects, on-line diagnostic of the active part and bushing conditions, reduction of disconnections for test execution. This process includes the installation of smart sensors, or IEDs, installation of communication network at field and integration of smart sensors to the field network. The field network is then interconnected to the Sage and DianE computer systems, thus enabling remote access to sensor data on-line. Once retrieved this data, the maintenance engineering teams at Eletronorte will be able to perform specialized analysis and cross-reference of information in order to enable the diagnostic and forecast of assets with no operation disruption, thus improving the quality of information available, optimizing processes and reducing maintenance costs of the company. To assure operation safety and reliability of the electrical transmission system, ONS and Aneel establish the regulating standards, which determine the performance criteria and penalties for lack of fulfillment, which then determine the periodical and predictive maintenance activities for the substation equipment, so as to assure its reliability for the operation. A study conducted by Cigré  provides a map of the fault sources in the transformers,where it is clear the importance of monitoring not only the active part of the transformer, but also the ancillary equipment, such as bushings. 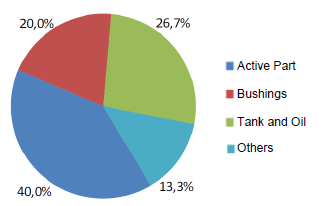 The graph below evidences the importance of monitoring the active part of transformers, as well as their bushings and the oil condition. To do that, it is necessary to use a special class of sensors, Intelligent Electronic Devices – IEDs, which are capable of digitizing, processing, storing and transmitting the information acquired at field over digital communication networks. 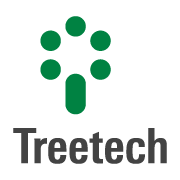 These sensors must be arranged in a decentralized and modular architecture, in such a way that each one of them performs a specific function in an autonomous and independent way from the others. Thus, the systems reliability and availability increases, as an eventual failure in an IED will not affect the performance of others. Whenever possible, we looked for avoiding agglutination, in a single piece of equipment, of specific functions that must be performed by several autonomous IEDs. In addition to the concern with the system reliability, the architecture chosen for sensing makes the system modular, thus enabling the deployment of a monitoring system in stages, and facilitating the future expansion of its functions. Depending on the specific task being performed, each sensor has unique features, but as they are inserted in a common environment, there is also a series of characteristics and features that must be common to all of them. First, there should be at least one communication port available for integration of IEDs to the remote monitoring software. The RS485 standard has been chosen as it provides great immunity to electromagnetic interferences, associated to easy installation and low cost. Modbus and DNP3.0 protocols have been selected as they are widely used in the market, simple to install and have low cost. Then, it is necessary that IEDs enable saving the measurements and alarm occurrences in a mass memory, as in case of communication network intermittence, the information must be archived directly from the IED, maintaining the integrity of the database upon the communication recovery. The internal clock in IEDs is essential for operation of this mass memory in order that measurements and alarms are saved with timestamp of th occurrence. Batteries should not be used to maintain the clock adjustment in case of outage of power to the IED, as they would be changed after a number of years, generating great work load to the maintenance teams and high costs to Eletronorte. Accepting multipurpose power supply voltage (38 to 265V ac/dc) is an important feature of IEDs, as it facilitates tests or provisional power supply in case of emergency by any source available. Under normal conditions, all the IEDs supplied are fed at 125Vdc power from the battery system at the substation, which assures the continuity of its operation, but exception situations may occur, and is just within these periods that achieving and saving data can be more important. Finally, as these pieces of equipment are complex electronic devices, it is important that the IEDs provide self-diagnostic function to indicate eventual wiring failures, power outage, internal faults of the IED itself and measurement sensors connected to it. The self-diagnostic function has the purpose of enabling to detect and diagnose eventual external and internal defects, and permitting that in most cases the own user identify and fix the problems quickly. IED (Intelligent Electronic Device) sensors must perform several tasks under adverse conditions and remain operating with reliability and practicality. Due to very demanding conditions at field for most of the electronic pieces of equipment, IEDs must be designed, built and tested specifically for use in the environment of the substation yards. Thus, the dielectric tests on the transformer and bushings (voltage applied, impulse voltage, etc.) must be carried out with the IEDs completely installed and connected to transformers, and these devices , as well as the transformer, must withstand the tests without any damages. Assim, os ensaios dielétricos no transformador e buchas (tensão aplicada, tensão de impulso, etc.) devem ser realizados com os DEIs completamente instalados e conectados aos transformadores, devendo esses, assim como o transformador, sobreviver sem danos aos ensaios. In this context, attention must be also paid on the fact the high temperatures can lead to early aging of the electronic components when the maximum operating temperature of IEDs is not correctly specified. As an example, we take the document “Technical Notes For Electrolytic Capacitor” , of the capacitor manufacturer Rubycon Corporation, which shows how “The lifetime of electrolytic capacitors made of aluminum depends on the temperature, and doubles when the temperature decreases by 10°C, based on the Arrhenius Law” (our translation). This principle can be used to estimate the durability of electronic devices, such as IEDs, when submitted to high temperatures, in a similar way as used for calculating the lifetime of transformers. In function of the information above, we chose in the IEEE C37.1-2007 standard the temperature class that most approaches, which is category (1.a), maximum temperature of 85 ºC. Once defined the characteristics common to all the IEDs, we must pay attention on the specific characteristics to be presented by an IED to perform its individual function. Due to the importance of transformers, Eletronorte decided to start its monitoring project with temperature sensors, for the active part of the transformer, and with on-line monitoring of bushings. To follow the active part of the transformer, which includes windings and their insulation, the key magnitudes to be monitored are the loading, oil and winding temperatures, as this enables to prevent that overloads and overheating led to catastrophic failures. In addition, this is an important data to calculate the lifetime expectation of the insulation in the active part of the machine, as its deterioration is a function the temperature it is subject to. At least, they have two outputs in programmable mA current loop, for oil and winding temperature. This set of functions assures good thermal tracking of the transformer, providing protection to the asset and enabling better planning of maintenance and investments. Another sensor adopted in the monitoring plan of Eletronorte was the IED for bushing monitoring. Monitoring the condensive bushings is a good practice for smart management of the transformers, as in spite of being relatively inexpensive accessories, the failure of a bushing may damage the transformer which it is installed on, remove it from the electric grid, thus causing losses much higher than its value. During normal operation of a transformer, several external phenomena can originate transient overvoltages, such as switching surges and atmospheric impulses. Due to the interface function they perform in this equipment, bushings are naturally the first ones to receive these stresses on their dielectric. Associated to the normal operational voltages which they are permanently subject to, this fact makes that bushings are pointed out in the statistics as one of the major failure points in power transformers – an international survey carried out by Cigré revealed that bushings cause 20% of all the forced and scheduled disconnections on transformers without switchgear under load at substations . In addition, an eventual failure of the dielectric on a bushing is a situation of extreme risk for people occasionally close to the equipment, due to the porcelain fragments thrown at high speeds, and for the transformer where it is installed, as the burst of a bushing may cause fire and total loss of the equipment, or at least lead to a long downtime for cleaning and repairs in the active part. Since the high-voltage bushings have capacitive type construction, with several insulating layers interleaved with conductive layers, as shown in the figure below, the on-line measurement of capacitance and tangent delta changes in the phase-earth insulation enables the early detection of most of the defects . Some transformers provide a special feature – the existence of Bushing Potential Devices (BPD) connected to the bushing taps – which demands the application of a bushing monitoring system specially adapted. 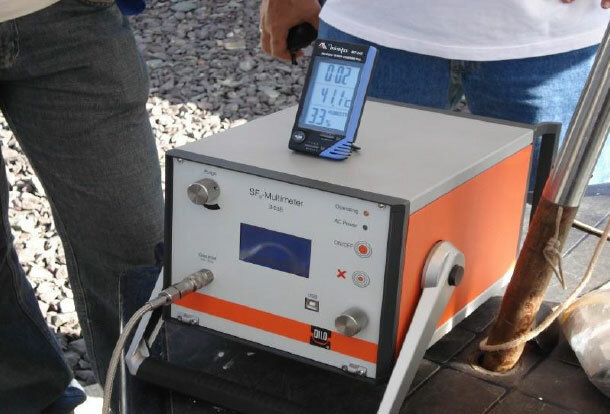 In normal applications, where there is no BPD, the monitoring system is directly connected to the bushing tap in order to measuring the dielectric’s fault current , and thus monitoring its capacitance and tangent delta changes. 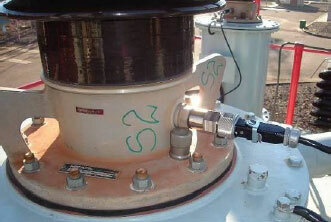 This application is shown in figure 4 below, where we see an adapter connecting the bushing TAP to the on-line monitoring system. By their turn, in bushings with BPD, the tap cannot be used for monitoring purposes. For these applications,the supplier must deliver a monitoring system that enables a special solution, in which the BPD outputs, which have nominal voltage of 115V, are used for bushing monitoring. Alarm by very high fault current in bushings. As previously mentioned, all the IEDs are provided with one communication port for integration to a communication network, in order to enable on-line transmission of their information and integration to a remote computer system. The local network communication standard chosen was RS485, due to its high immunity to electromagnetic interferences, operation in differential modem long distance of transmission (up to 1300 meters depending on the transmission rate), easy use and low installation cost and decentralized topology, which enables future integration of new IEDs to the network in a very easy way, by only connecting two wires. For this local network, Modbus and DNP3.0 protocols have been chosen, as they are open standards, widely used in the market and providing features that meet in an effective way and at low cost the requirements of an equipment status monitoring system. This local network connects all the IEDs at the substation’s yard and then is converted to optical fiber media for interconnection with the control room, where it is connected to the corporate Intranet of Eletronorte via proper converters, thus making feasible the remote transmission of information to the regional and head offices of the company. Shown in the image below is a 230/69kV 30 MVA transformer at the Nova Mutum substation. The IEDs chosen for its monitoring are located at right. The smart sensors for monitoring of oil and winding temperatures (top right), as well as the bushing monitor (bottom right), are installed inside the control panel of this transformer. With two types of IEDs only, it is possible to monitor the transformer components responsible for 60% of the failures not related to the switchgear. In transformers where specific elements are considered as critical, other IEDs have been applied and integrated to the system, such as the ones specialized in measuring hydrogen concentration in the gas, regulating the voltage, among other functions. Thus, the discerning selection of smart sensors for the transformers and reactors enables Eletronorte to deploying modern monitoring systems, which allow the early detection of failures, collaborating with the objective of increasing the reliability and availability in the electric power supply, while promoting the conditions for low-cost energy rates.